This personalised 'You & Me' print is an oh so romantic gift to treasure. 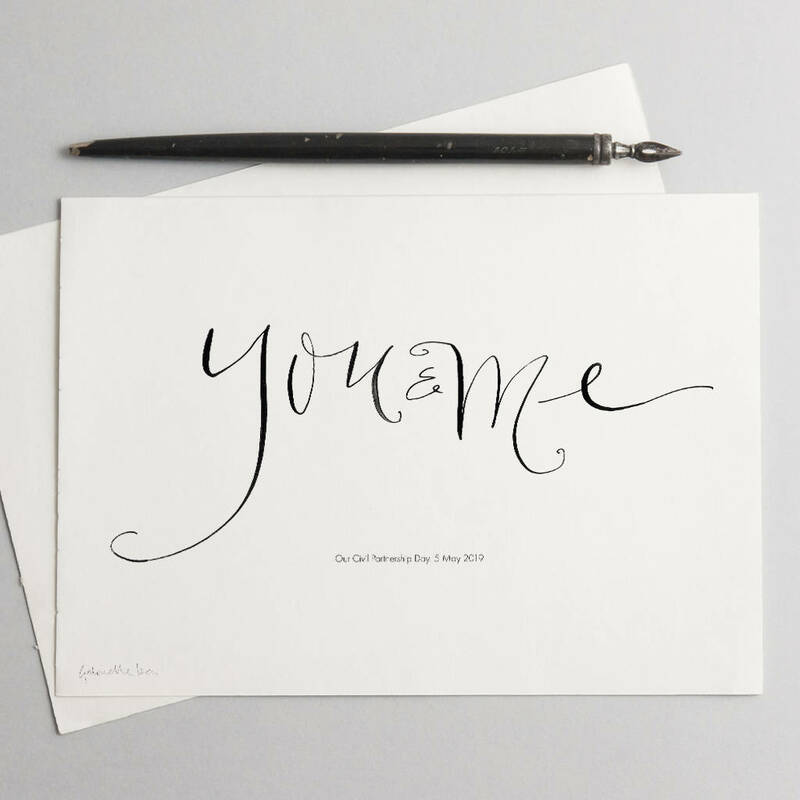 With a feeling of old-world romance, this personalised romantic art print makes the perfect gift to celebrate a unique love story. The first anniversary gift is paper, so this would be a thoughtful gift which will be cherished for years to come. The calligraphy was originally drawn by hand with a traditional dip pen and Indian ink, in a flowing style. A stylish monochrome piece of work. 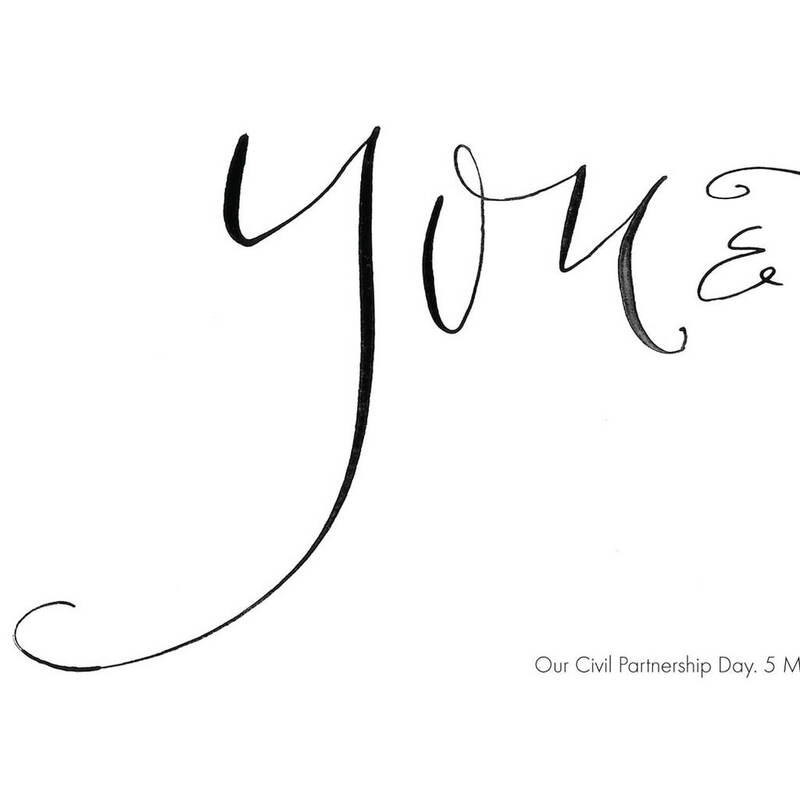 Add your chosen names, dates, locations or a short message typeset in a simple font under the calligraphy. BESPOKE OPTION You can also commission your own special art print. Your word or words will be drawn by hand and printed on an FSC accredited soft white board. A low-res visual will be sent to you via your order enquiry for approval. The details will be copied directly from your order. 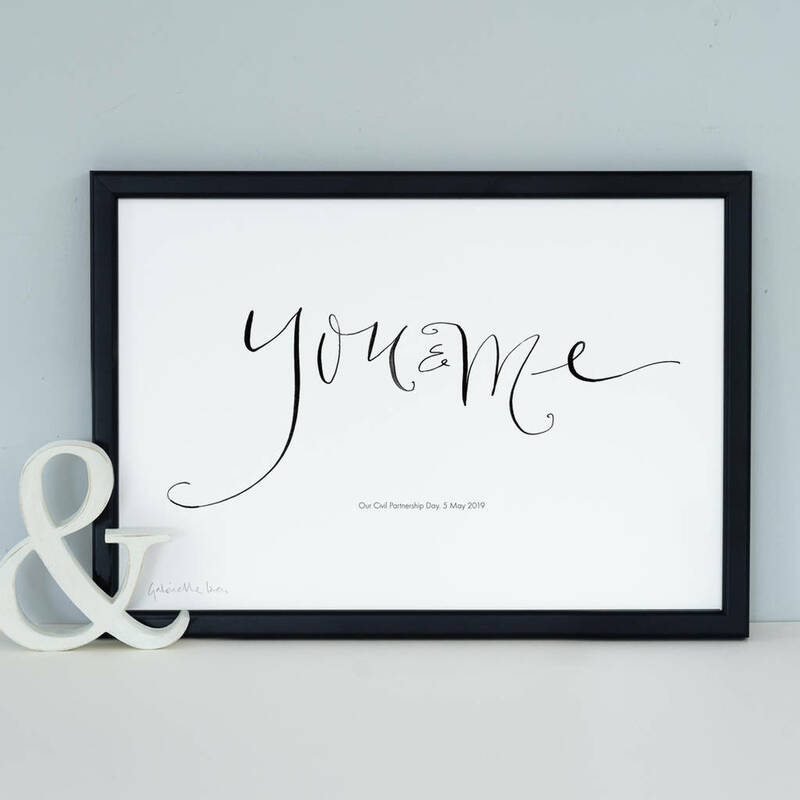 This personalised 'You & Me' print would make a thoughtful wedding gift, engagement gift, anniversary gift or a bridesmaid gift. It would also make lovely gifts for Christmas, Valentine's Day, a special occasion gift or a birthday gift. It's perfect for sistesr, brothers, son, daughter, cousins, bridesmaids, friends, best friends, bestie, girl friends, boy friends, wife, husband, mum, mummy, auntie, uncle, dad, daddy, mother in law, father in law, step mum, step dad, granny, granddad. The artwork is digitally printed and personalised just for you. A low-res black and white visual will be sent to you via your order enquiry for approval. The details will be copied from your order, so please check all spelling and grammar! You can now choose to send this art print direct to the recipient as a gift. Perfect if you're overseas or in a hurry! Please ensure you provide the correct message for the personalisation and the recipient’s name and address. The artwork is printed on A4 landscape FSC accredited 280gsm matt board, is hand finished and signed. The print comes in a cellophane bag with a backing board and is sent flat in a solid card envelope with an outer waterproof bag. The print is A4, W21 x D29.7 cm and will fit any A4 landscape frames.